What is the POONGSAN dog? The Poongsan dog is a northern spitz-type dog from an area now controlled by the North Korean government. The breed is typically a creamy white and with a thick double coat, curved upright tail, and mostly upright ears. They are slightly larger than the South Korean Jindo dog. There are many stories about the origins of the Poongsan dog. One of the stories is that the Poongsan originates from the combination of wolf and dog. A more modern theory, based on similar hunting ability, is that the Poongsan dog share some common origins with the Laika dogs of Siberia. 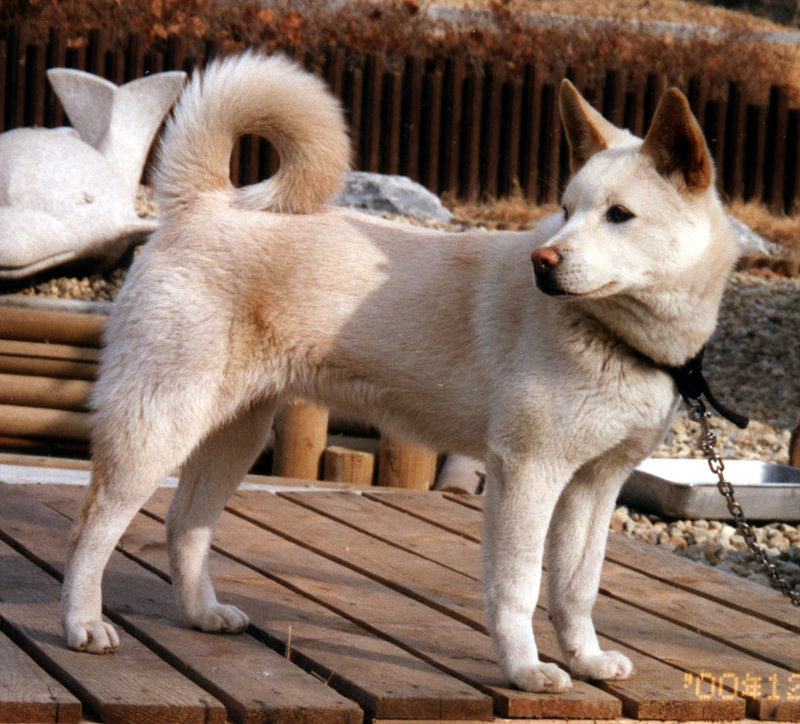 The most prevalent belief seems to be that the Poongsan dog was tamed by the Koreans during the New-Stone Era and left isolated high in the Baiku Mountain (elevation 6,000 ft) area, creating the present known breed. Even though the Poongsan dog is of ancient origin, there was little in-depth knowledge of this breed during this past century due to wars and politics. Under the Japanese occupation, the Poongsan Dog was slaughtered to make fur coats for the Japanese army and their numbers were decimated until they were designated Korean Natural Treasure no. 128 in 1942. After World War II, the Poongsan dog population was again decimated by the Korean War. After the Korean War in 1965, the North Korean government made efforts to preserve this breed through designated breeding farms and military bases and vigilantly kept the breed within its borders for many decades. As communication between North and South Korea was very difficult, information about the breed was very scarce and difficult to obtain. This lack of information became especially apparent in the 1990's when people started to claim to have successfully imported groups of Poongsans from North Korea into South Korea. A huge demand developed for a North Korean Poongsan from wistful South Koreans and unfortunately, there came the belated realization that these groups of exports DID NOT LOOK LIKE EACH OTHER. These were very obvious differences in structure and bone- most notably the head of the dogs. Either there are multiple dog types in Poongsan, N.Korea and all are referred to as Poongsans, some exporters were being deceived with fakes or mixes, or there were unscrupulous people creating fakes in South Korea. Because of this, there were heated debates on whose Poongsan was a real, purebred Poongsans for many years. Picture from a North Korean ad. Stamp of a Poongsan Dog from the DPRK. On June 13, 2000, South Korean President, Mr. Dae Jung Kim, took a couple of the Jindo puppies to North Korea when he visited North Korea for N-S Summit talk. He gave those Jindos to the North Korean Leader, Mr. Jong-Il Kim. Those Jindo puppies were carefully selected and named Pyung-wha (Female, meaning peace) and Tong-Il (Male, meaning unification) by Mr. Moo Jong Woo, who is president of the Korean National Dog Association. The two Jindos were born on April 23 and April 22 respectively. After the summit talk ended successfully, North Korean Leader Kim gave a couple of Poongsan Puppies to South Korean President Kim as a sincere gift. The Poongsan puppies named Dan-kyul (meaning solidarity) and Ja-ju (meaning self-reliance) were born at the Central National Zoo in Pyung-Yang, North Korea. Mr. Woo was assigned to take the Poongsan puppies to raise and breed after ~3 weeks by care of the Blue House, which is the presidential residence in South Korea. On June 23, 2000, at the suggestion of South Korean leader Mr. Dae-Jung Kim, the two Poongsans were later renamed. The male was renamed to Wuri (meaning we or together) and the female was renamed Duri (meaning two). The female was born on 4/14/00 and the male on 4/22/00. They were hand-picked by Mr. Jong-Il Kim. On Dec. 12, 2001, Duri whelped a litter of 5 males. The father is one of 4 Poongsan dogs that had been sent from Pyongyang Zoo in 1999 in accordance with an agreement on exchange of animals reached between the north and the south. Wuri was considered too immature at the time.